A program developed by the University of Indianapolis Center for Aging & Community (CAC) is receiving recognition from the State of Indiana as an industry standard-setter. CAC works to improve the quality of life for all people as they age. Many of those people live in nursing or long-term care facilities. In 2016 and 2017, CAC worked with the Indiana State Department of Health (ISDH) to use the expressive arts – drama, writing/memoir, dance, music, and visual art – to improve the quality of life for Hoosiers living in nursing facilities. 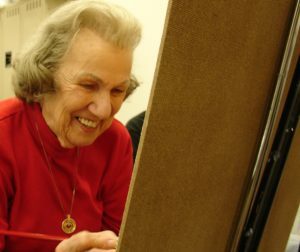 That effort, called Expressive Arts for Long Term Care Professionals, has been recognized as the 2017 Promising Practice for Education and Communication by the Association of Health Facility Survey Agencies (AHFSA). The program was funded by ISDH and coordinated by CAC. The CAC project team included Ellen Burton, MPH, senior projects director; Lidia Dubicki, MS, project director; and Kayleigh Adrian, MS and Kennedy Doyle, project coordinators. UIndy faculty Rebecca Sorley, Department of Music, and Sara Tirey, Department of Art & Design, served as faculty for the training workshops. Training workshops were conducted throughout the state of Indiana to teach nursing home personnel how to incorporate the use of the expressive arts into the daily lives of residents in a systematic and meaningful way. Participants were taught how to introduce and modify expressive arts activities based on the functional capabilities of the residents. Feedback has been overwhelmingly positive. “This stuff works!,” wrote one participant. CAC Senior Projects Director Ellen Burton presented “The Power of Expressive Arts in Indiana” at the LeadingAge Indiana Fall Conference in late September.